Since everything which can be knitted can be knooked, similarly, this cast-on and bind-off, while shown for knooking, can equally be used for knitting. But it does require intermediate to advanced crochet skills. If you are already familiar with foundation single crochet, it is going to be easy. So what is this cast-on and bind-off? The cast on is simply foundation single crochet (fsc). I will not provide a tutorial here how to do that. There are plenty of photo and video tutorials on the internet. My favorite tutorial is this tutorial by futuregirl. The bind-off I created is nearly identical to an fsc cast-on, so you'll get nice symmetrical results. Why use this cast-on and/or bind-off? Because it is crocheted, it is very sturdy. But, it is also stretchy, unlike a regular crochet cast-on and bind-off. And because it looks like a double braid, it's decorative too. Here you can see the stretchiness at work. Before, the stretched out sock cuff was 7 cm wide, fully stretched it is 10 cm. Since this is in the round, we actually go from 14 to 20 cm, so the full stretch is 6 cm. The bind-off has the same stretch. If the pattern tells you to cast-on 56 stitches, then make a fsc chain that is 56 stitches long. Now you pick up stitches from this chain. But you have to pay attention, since the fsc chain has a front and a back side and front loops and back loops. Before you are going to pick up stitches from the loops, make sure that the front side is also going to be on the front of your final knitted piece. This means you might need to cut the yarn and start again from the other side, or do an extra row if that doesn't mess up your pattern. If you are going to use this technique for socks, for which it is very suitable, just make sure the front of the fsc chain is on the outside. The bulk of the fsc chain will also help prevent twists. Now pick up stitches from the loops. If the front of the fsc chain is facing you, pick up stitches through the back loops and if the back is facing you pick up stitches from the front loops. I can't tell you how to wrap your yarn around your needle, the final stitch mount you need depends on your style of knooking or knitting. Cast-on such that you won't end up with twisted stitches (unless that is what you want). Now we are going to bind-off. When you are working in the round the bind-off direction is important. 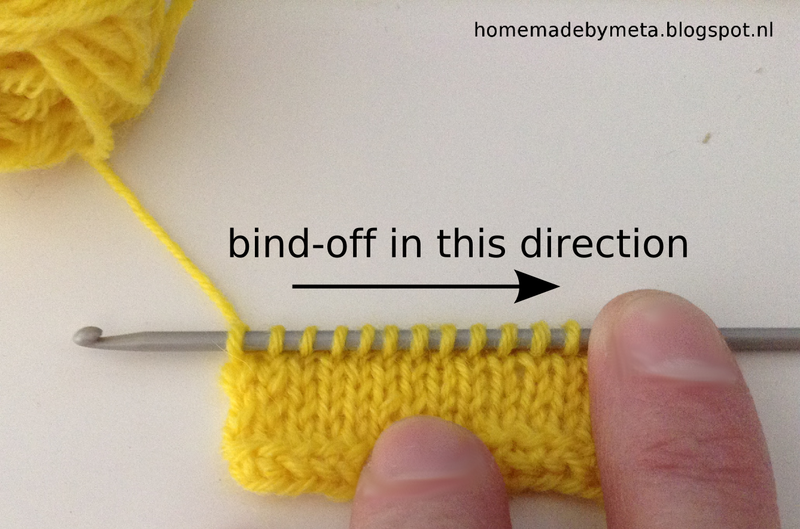 You have to work back when doing the bind-off instead of keeping on working in the round. If you don't do this you will end up with the wrong side at the front of your work. Here are the steps for the bind-off (I show the first and second stitch). I prefer to switch to a regular crochet hook of the same size as my knook (if you're knitting, also switch to a crochet hook). I use US crochet terminology. Start with 2 chain stitches. Now pick up the next unworked stitch. If you have it on a cord, you can leave it on the cord if you like (or slip it off). Otherwise slip it off your needle at this step. 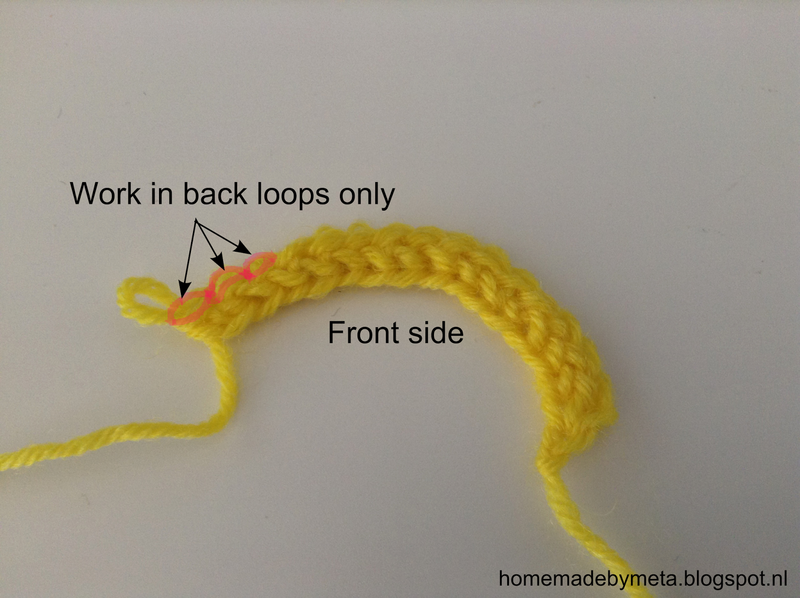 Now turn your hook and enter it below the top two loops of the first chain stitch you made. This is the most fiddly part of this bind-off. Yarn over and pull through two loops on hook. Yarn over and pull through all remaining loops on the hook. You finished the first stitch! Pick up the next unworked stitch from you needle/cord. 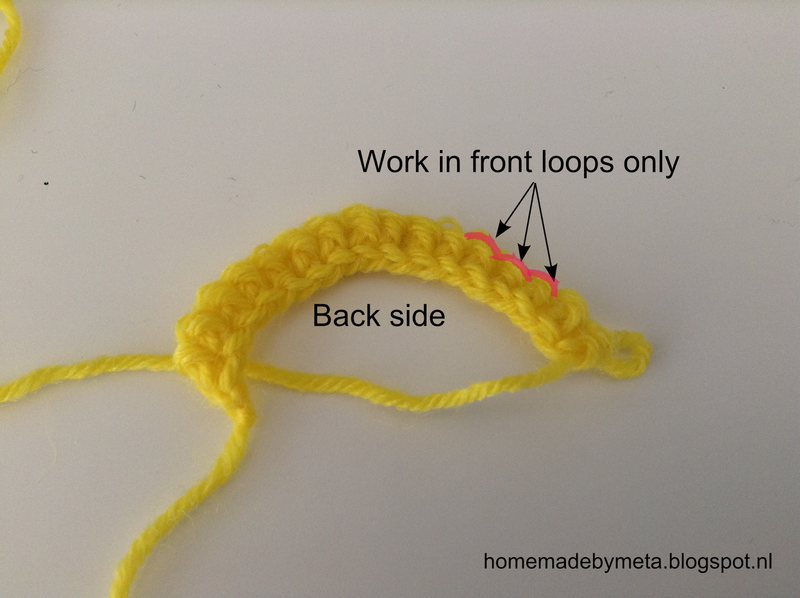 Turn and enter your hook below the top loops of the last chain stitch you made. Finally, yo and pull through all remaining loops to finish the second stitch. Continue in this fashion until you worked all loops on your cord or needle. If you work in the round you can use the tail to sew the two ends of the bind-off together. When finished you can see that the cast-on and bind-off look are really the same. The reason why they look slightly different is that there is more of an angle between the two "braids" in the cast-on. I must try this. You are full of novel ideas.